CAL’s overarching message remains that the Clean Air Act must be updated for modern fuels and technologies and enforced, together with other air pollution legislation, to protect public health. The UK is compliant with the limit values for PM10 and the target value for PM2.5, but future objectives for PM2.5 including the National Exposure Reduction Target may be more challenging to meet. The continued control of small scale combustion may be important for achieving this target. The UK also has some localised areas of exceedance of the target value for polycyclic aromatic hydrocarbons (PAHs), mainly associated with industry. The [Clean Air Act] CAA therefore helps control emissions from combustion which is important for meeting national emission reduction commitments as well as for ambient air quality. The 2012 Assessment of the effectiveness of Clean Air Act measures showed the effectiveness of Smoke Control Areas in controlling ambient levels of PAHs, PM2.5 and PM10. Without the Clean Air Act measures it is likely that concentrations of these pollutants would be higher and this could worsen the compliance situation with the relevant limit and target values. CAL notes also that the Call for Evidence “outlines selected stakeholders’ views for improving the Act. Note that these are not Government views or proposed policy options and the feasibility of their implementation has not been considered” (page 1). In CAL’s opinion it is particularly feeble of Defra to launch a Call for Evidence that excludes the Government’s views or proposed policy options and which has not considered the feasibility of implementing selected stakeholders’ views. This decision by the WHO creates a paradigm shift in the true sense of the words. It means there is no ‘silver bullet’ solution to tackle outdoor air pollution. Instead, we must all work together to tackle all aspects of air pollution. The Mayor’s consultation highlighted particularly the dangers of allowing the more polluting technologies and/or fuels in cities e.g. biomass, diesel etc. Please consider also responses to the Mayor’s current consultation on ‘The control of dust and emissions during construction and demolition’ e.g. non-road mobile machinery. The removal of the M4 bus lane highlights the need inter alia to: comply with Directive 2008/50/EC; ensure limit values are not exceeded once attained; and ensure air pollution is not worsened when limit values are exceeded. It is clear from the Call for Evidence that weakening the Clean Air Act would cause breaches of Directive 2008/50/EC. action on air pollution from medium scale combustion installations. 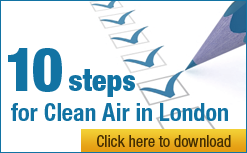 Please ensure that Defra’s review of the Clean Air Act takes account, as far as possible, of changes proposed by the European Commission not least to future proof the Clean Air Act. Please consider again CAL’s response to the Red Tape Challenge dated 21 September 2011 together with the new evidence submitted above all of which form part of this response to the Call for Evidence. Please contact me if you would like to discuss this submission.